This photo was taken in 1979 in Galle Face, Colombo, Western, LK. 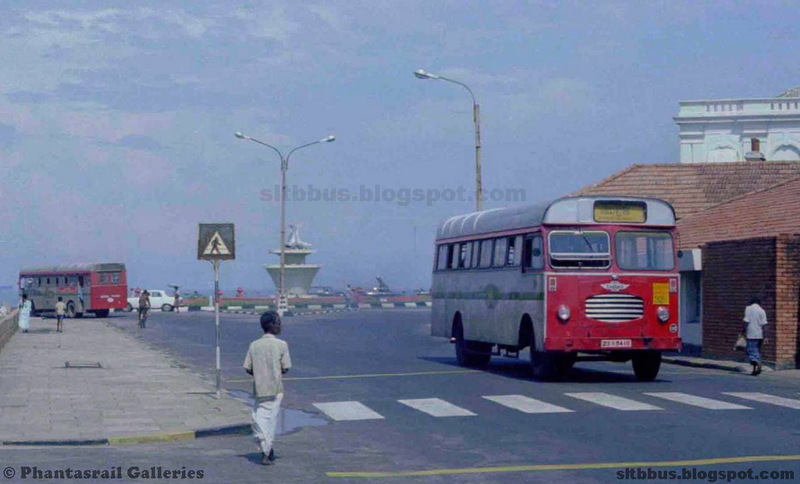 Sri Lanka Central Transport Board (SLCTB / Now SLTB) Ratmalana depot, CTB bodied Ashok Leyland Comet bus (23ශ්‍රී5418) at Galleface in 1979. Playing on the route no 32 from Kataragama to Colombo. Photo courtesy: Phantasrail Galleries -- ශ්‍රී ලංකා මධ්‍යම ගමනාගමන මණ්ඩලයේ (ශ්‍රී ලං.ම.ග.ම. / වත්මන් ශ්‍රී ලං.ග.ම.) රත්මලාන ඩිපෝව යටතේ ධාවනය වූ අශෝක් ලේලන්ඩ් කොමට් වර්ගයේ ලං.ග.ම. බඳ සහිත බස් රථයක් 1979 වසරේ ගාලු මුවදොර දී. රථය මාර්ග අංක 32 යටතේ කතරගම සිට කොළඹ බලා ධාවනය වන අවස්ථාවකි. මෙම බස් රථය ධාවනයට එක්වූ අවධියේදී අශෝක් ලේලන්ඩ් යනු බ්‍රිතාන්‍ය ලේලන්ඩ් මාදිලියේ උප මාදිලියකි. එහෙයින් මේවා ඍජුවම 'ලේලන්ඩ් කොමට්' ලෙස ආමන්ත්‍රණය කිරීමෙහිද වරදක් නැත. ඡායාරූපය Phantasrail Galleries. මේ බස් එක ට සමාන හැඩයක් තිබෙන ලංකා 1 ,බස් රථය කතරගම ..කොළඹ මාර්ග අංක 32 ධාවනය වුණා සවස 4 .5වගේ වේලාව ට.